News about people who are not me. This lasted about two days, as the entire rest of the world had different plans. Stuff had to be dealt with! Stuff that could be neither ignored nor postponed. They existed on their own timelines. They overlapped timelines! They wrapped their timelines around each other into mutual strangleholds and battled each other like snakes! It would have been exciting if it wasn’t exhausting. Wait, no it wouldn’t. I’d tell you more, but while I’m free to natter about my own life, I’m reluctant to provide details of other people’s lives. So, we stay metaphorical and hypothetical. More fun that way, anyway. Feel free to insert assumptions of your own imagining, as a creative exercise. Anyway, I have, like, a day and a half to catch my breath before diving into the cleanup and recovery phase of the events in question. I could recap my trip, and Worldcon, and the wonderfulness of that (before the cross-country-plaguemobile part); but I only have a little bit of time available to write this blog post, so… I’ll eke that out over a few posts in a week or so from now. But in the meantime, fortunately, I know cool people, who do cool things that I can tell you about. Which helps both you and them. 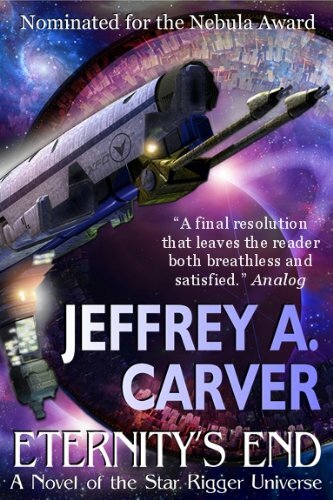 The ebook version of Jeff Carver’s Eternity’s End is currently on sale for 99 cents. This is a great way to step into Jeff’s Starrigger Universe, and there’s plenty more where that came from. Seriously, if you love SF that roams the wild space-ways, this is for you. It’s available pretty much everywhere: Amazon, Nook, iBooks, Kobo, and Google Play. The trailer only mentions Downpour, but the audiobook also available from Audible (free with trial membership, too) and iTunes. The guy doing the narration, Stephan Rudnicki, is actually one of my favorite narrators. I know his voice so well — it’s nice to see his face. 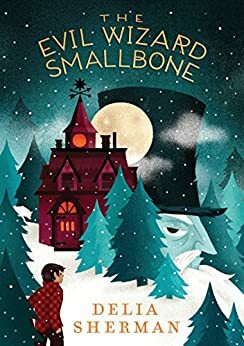 Delia Sherman’s new Young Adult book The Evil Wizard Smallbone is out! My sister has the hardcover, which has this brilliant wrap-around cover, and I got the Kindle version (for convenience, plus instant gratification) and I do love it. Come on, you know you read YA. Admit it. Okay, pretend you’re getting it for your nephew or niece or whatever. But I see through you. The Sirens literary conference (October 20-23) has Laurie J. Marks as a Guest of Honor this year. Laurie is the author of the acclaimed Elemental Logics series (among other works), and like Delia, is a member of my writing group. The Sirens website has even posted an interview with Laurie, which you can read here. Must go now. I have all day tomorrow free from snake-battling events. Must grab it while I can. UPDATED to include link to two battling snakes.